Ask fellow campers about "Unadilla / I-88 / Oneonta KOA" and nearby attractions. We are full timers and have stayed at over 40 KOAs over the last year and a half. This is an old campground that is poorly maintained. The roads appear to have been grave but now are dirt and in need of gravel. Our site was similar to the roads -- dirt with a little gravel ground into it. 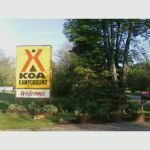 This was by far the worse KOA we have ever stayed in. It appears that the majority of campers are a combination seasonal and long term with poorly maintained sites. Amenities were lacking -- no sewer (we knew that when we made our reservation), no wifi, no cable, no over air TV, poor drainage during periods of rain. The only positives -- polite staff and quiet campground. We will not be returning. We camped at Unadilla / I-88 / Oneonta KOA in a Fifth Wheel. Getting to this RV park was a nightmare. As we exited the highway at exit 11 the KOA sign said turn left. Our RV GPS said turn right. So did my wife's Google maps. We turned right. That took us to a hair pin turn. We attempted it half way and gave up while blocking traffic in both directions. One lady we were blocking told us continue down the road and take the next left. That worked although the roads are very narrow with a narrow bridge to cross with no warning signs about Gross Weight allowed. Finally arrived at RV park. Very neat and clean. However, we have a 43 foot 5th wheel and not much room for us. They put us in spot 101. It was narrow but long enough. Plugged into the 50 amp box. I pushed circuit breakers up thinking I was turning them on. It is wired just the opposite. Up is off and down is on. That started what we thought was an electrical problem. Their maintenance guy showed up immediately. No sewage hook ups. Overall it was an experience. We camped at Unadilla / I-88 / Oneonta KOA in a Fifth Wheel. DON'T TAKE THE HAIR PIN TURN!!! It's a little awkward getting to it. BE SURE TO ASK FOR DIRECTIONS! Depending on your RV, there are 2 approaches and one avoids an impossible turn. The staff is happy to help you with the directions. Use their advice approaching and leaving. Once there, it is a lovely campground well maintained and neat. We were just passing through and were able to get a pull through. Owner was extremely nice and helpful. Well stocked camp store too. I would definitely stay here again. We camped at Unadilla / I-88 / Oneonta KOA in a Motorhome. We stayed in a rental trailer. 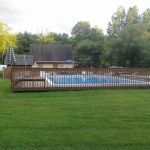 Friendly staff, nice pool, outdoor evening movie We camped at Unadilla / I-88 / Oneonta KOA in a Travel Trailer. We arrived in the middle of a thunderstorm that left inches of rain on the road and several inches on our site. We had only been able to reserve a 30 amp site online but when we arrived and the owner found out we had 50 amp he placed us in a site serviced by 50 amps. The adjoining site was right next to us with the hookups between us and barely enough room to walk between the RVs with sides out. There is a trout stream in the campground so there are no sewer hookups at any of the sites per law. The owner said they plan on putting some in "on the hill" away from the stream in the future. The roads from the Interstate are narrow and winding and it is about 7 miles to the campground with little in the area. We camped at Unadilla / I-88 / Oneonta KOA in a Fifth Wheel. This was a very nice campground with very nice and helpful owners. It's about a 10 minute drive off I88 in a quiet area. Nice wide sites with lots of trees. Propane is also available. We camped at Unadilla / I-88 / Oneonta KOA in a Travel Trailer. Very nice and helpful owners. Site was level and park quiet. Enjoyed our stay very much and will stay here again if we're in the area. We camped at Unadilla / I-88 / Oneonta KOA in a Motorhome. Camping rate is with KOA discount. The KOA online reservation system put us on a site incompatible with our size. The staff worked hard to get us an appropriate site. We ended up with a grassy pull through with more than enough space. Entry into the campground and maneuvering within the campground were very tight. If you are over 40 feet long, I'd probably not recommend it. We were there during a time when there was a large motocross race taking place - many loud motorcycles in park. Water line had to be shared with another camper - low water pressure. Likely wouldn't return. We camped at Unadilla / I-88 / Oneonta KOA in a Motorhome. I don't chose 10 to often. I realize that lack of cable and sewer might be a detriment for some. Given what it does do well, however, it's a very pretty and well kept sight. The seasonals are a real plus. They keep a very high standard. Pool was crystal clear. Staff accommodating. We're overnight here as we have in the past and will do again. Be careful to follow signs off of I-81, exit eleven and not GPS. We camped at Unadilla / I-88 / Oneonta KOA in a Travel Trailer. Staff helpful and friendly. Older park with over 50% seasonal trailers. We stopped for one night during the week. Very quiet with most seasonals not there. WiFi was great. Pleasant park during midweek. We camped at Unadilla / I-88 / Oneonta KOA in a Motorhome. Small park. Be sure to follow signs off I-88. Nice people. No cable or sewer hookups. Dump site available. Many seasonals but they were congenial. Good for overnight. We camped at Unadilla / I-88 / Oneonta KOA in a Travel Trailer. I'm a little late with this review and thus I am not positive about the cost. We arrived in the middle of the flooding from "Lee" but the very gracious and friendly owner/operators found us a relatively dry site. We spent only one night. No TV. I felt that the Oct 2010 review by another was accurate. We would return. We camped at Unadilla / I-88 / Oneonta KOA in a Travel Trailer. This is a very nice KOA, off the beaten path and quiet. Be sure and follow the signs which direct you to the campground; your GPS may guide you to a road with turns that can't be negotiated by big rigs. The staff is friendly and the park in well-maintained. There is a disposal station on site, but no sewer hookups...not an issue for a short stay. We liked this park and we would stay here again. We camped at Unadilla / I-88 / Oneonta KOA in a Motorhome. This rural KOA is on the north side of I88. Access is via a narrow rural but well paved road. The campground is is a horseshoe, with a steep hill on the north and a stream on the south. Sites and interior roads are gravel. Interior access is very good. All sites are level. Seasonal campers are mostly along the stream and are kept very neat. Lots of places to walk dogs. The staff was very helpful, insuring we got a site where we could get satellite coverage. We will certainly stay here again. We camped at Unadilla / I-88 / Oneonta KOA in a Motorhome. 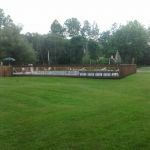 Are you affiliated with Unadilla / I-88 / Oneonta KOA ?